Come join La Cocina on October 13th to enjoy the delicious dishes of 30+ talented chefs born out of La Cocina, and a few others who had to jump in on the party. You won’t want to miss out on what these incredible chefs will be cooking up. The fun doesn’t have to stop at grabbing a bite (okay, a few bites…plus some to take home). Come out for a few extra hours and volunteer with the La Cocina team. Volunteers will receive free access to the festival and a La Cocina t-shirt. 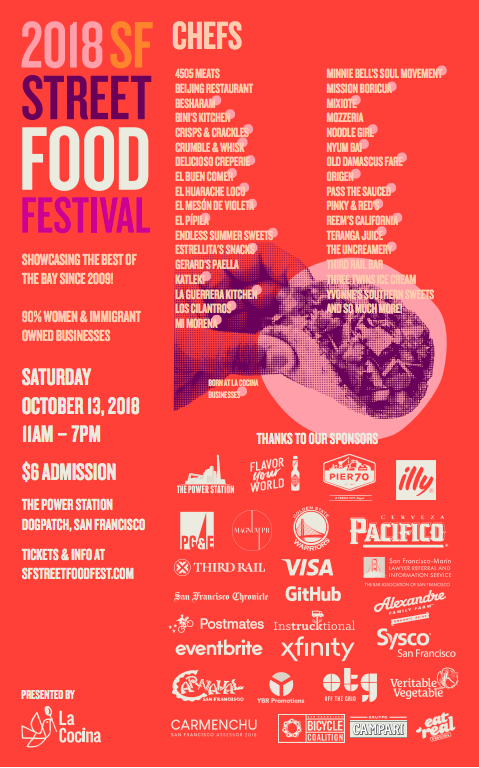 La Cocina’s San Francisco Street Food Festival is a vibrant celebration of community, culture, and entrepreneurial spirit featuring 30+ Bay Area chefs and restaurants. Come for a full day of eating and drinking and stay for a festival that promotes equity for women, immigrant and POC-owned food businesses.